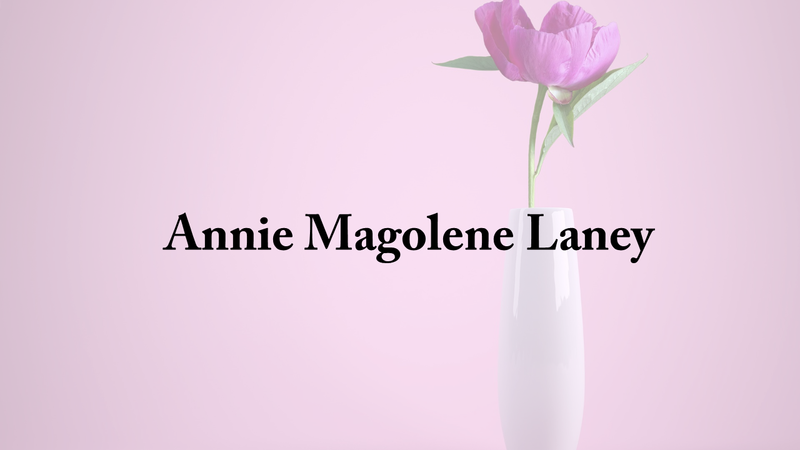 Annie Magolene Laney, 96, of Vinemont, Alabama entered into rest on Sunday, Feb. 10, 2019 at Woodland Village in Cullman, Alabama. Mrs. Laney was born on Dec. 7, 1922 in Morgan County, Alabama. She enjoyed traveling and spending time with her family. Visitation will be held on Tuesday, Feb. 12, 2019 from 10 a.m. until 12 p.m. at Nichols Funeral Home chapel in Addison, Alabama with services following at 12 p.m. Brother Tommy Blackwood will officiate. Annie is survived by her daughters, Sue Parris and her husband Buddy, Polly Lawrence and her husband Roger; 11 grandchildren; 17 great-grandchildren; and 3 great-great-grandchildren. She was preceded in death by her husband, Athel Laney; daughters, Margie Pigg, and Shirley Speegle; and granddaughters, Terri Speegle, and Kaye Kugler.